It is a market reflex to sell bank stocks as Treasuries rally on the grounds that lower yields will reduce net interest income: they will – C estimates that a 100bps reduction in the 10-year treasury yield (T10) reduces annualized net interest income by ~$250mm. However, this pales against the estimated appreciation of nearly $2bn on the investment securities portfolio which, since it is largely booked as available-for-sale (AFS), flows to equity through other comprehensive income (OCI). Indeed, for C in 2016Q1, the 49bps decline in T10 lifted the CET1 ratio by 12bps to 12.34%; this provides a buffer of 184bps over the regulatory minimum requirement, including a 3.5% GSIB surcharge, of 10.5% versus guidance for the management buffer of 50-100bps. True, the binding constraint is CCAR which, under the 2016 severely-adverse scenario, reduced the CET1 ratio by ~6.1% relative to the 2015Q4 level, but applying this drawdown to our end-2017 estimate of 12.7% for the unstressed CET1 ratio generates a scenario-minimum of 6.6% versus the minimum requirement of 4.5%, or 7% including the GSIB surcharge for C; we believe the 40bps gap in the latter case will be covered by offsets when GSIB surcharges are incorporated into CCAR. In estimating the forward CET1 ratio, our model base-case assumes no capital benefit from OCI so that, if the above assumption of capital adequacy is accurate, such benefit is available to be returned to stockholders. This is above and beyond the gross 2017 buyback under the model base-case of ~$14bn representing 11% of current market cap and being highly accretive if executed with the stock trading, as it is today, at ~two-thirds of tangible book value. The base buyback corresponds to a payout ratio, net of employee issuance, of 100% as DTA-utilization at C continues to boost capital meaningfully beyond retained earnings and OCI (e.g. in 2016Q1 by ~$1.6bn vs. $3.2bn for earnings and $2.7bn for OCI). A key assumption is that risk-weighted assets (RWA) remain approximately flat at ~$1.25T through 2017 as run-off in Holdings offsets growth in Citicorp (where loans increased ~5% in 2016Q1 on a constant-currency basis but are flat in US$-terms). Holdings now accounts for ~11% of Citigroup RWA vs. 17% in 2015FQ1. Risks to the analysis are that lower-for-longer rates cause C to miss consensus earnings, which are used in our model base-case, and/or that C either chooses, or is required by regulators, to maintain a higher capital buffer in a low-rate environment because of valuation risk to AFS securities. As to the first, we know that the impact on net interest income of low Treasury yields is relatively small and will likely not shift the buyback estimate by more than $250mm. As to the second, the bears cannot have their cake and eat it: either a decline in Treasury yields is long term in which case the OCI benefit can be returned to stockholders or it is not in which case multiple compression should be modest. The market seems to be pricing a scenario where yields are lower-for-longer but the OCI benefit cannot be returned to stockholders because the next CCAR scenario will capture valuation risks in the AFS portfolio by modeling an upward shock in Treasury yields. It is a market reflex to sell banks on rallies in the 10-year treasury on the thesis that lower yields for longer will suppress net interest margins. This is true with C, for example, estimating that a 100bps decline in global government bond yields reduces annualized net interest revenue by ~$250mm (Scenario 4 in Chart 1) or ~6c/share representing less than 2% of 2016 consensus eps of ~$4.50. However, the immediate impact to capital is substantially positive because of the higher value of investment securities in a lower-rate environment; in the case of C, management estimates this mark-up, after tax affects, at nearly $2bn with a lift to the CET1 ratio of just over 20bps. There are two natural objections: first, that these estimates of rate-sensitivity may be unreliable and, second, that the capital boost is an artefact of asymmetric accounting where changes in the value of investment securities, if booked on an available-for-sale basis, are subject to mark-to-market accounting and so flow to equity immediately (through other comprehensive income or “OCI”) whereas the economic loss from the reduction in net interest income is subject to accrual accounting and so realized to equity (through earnings) over time. As to the first objection, history suggests Citi’s estimates of the capital impact of lower yield are reliable: in the 2016Q1, for example, the yield on 10-year treasuries fell ~50bps with a lift, through OCI, to the CET1 ratio of 12bps. The second objection is valid, of course. If the accounting treatment were to mark-to-market deposit franchises, and in particular the “endowment” benefit derived by banks from deposits that are acquired at below-market rates because of payments and other deposit-account services, then the capital lift from lower rates would evaporate. In practice, banks address this accounting asymmetry, and more general internal prudential standards, through maintaining a “management buffer” of capital over and above the required regulatory minimum with Citi CEO Michael Corbat suggesting 50-100bps. Given the regulatory requirement for C’s CET1 ratio, including a 3.5% GSIB surcharge, is 10.5%, the CET1 ratio at end-2016Q1 of 12.34% provides a buffer of 184bps and this is likely to have increased substantially in 2016Q2. In other words, C’s capital is so far in excess of regulatory requirement and internal prudential standard that there is no reason a further boost from lower rates cannot be returned to shareholders. The stress tests are not binding on such a boost: under the severely adverse DFAST scenario, C’s CET1 ratio fell 6.1% which, from today’s base, would generate a scenario-minimum of 6.24%; this is above the base requirement of 4.5% and within 80bps of the requirement, without any allowance for offsets, if it comes to include the GSIB surcharge of 3.5%. Regardless, to reflect this shortfall, our model increases the CET1 ratio by ~60bps through end-2017, implicitly allowing for some small offset to the incorporation of GSIB surcharges into the CCAR stress test, and generates a buyback of ~$14bn in 2017 assuming treasury yields stay where they are so that there is no rate-impact on OCI (see Chart 3). This represents over 10% of current market cap of $123bn. The above analysis uses consensus estimates for earnings with the risk is that these turn out to be too high if rates are flat. With consensus revenue-growth of 4% in 2017 off a cyclically depressed trading environment for FICC which contributes over 15% of C’s consolidated revenue, consensus does not appear to embed an optimistic rates vie; regardless, we know from C’s rate-sensitivity analysis that the earnings impact of low rates is small relative to the OCI impact although there could be an additional impact because lower earnings reduce the capital-benefit from DTA-utilization. Key support for our buyback estimate is that C is generating substantial regulatory capital beyond retained earnings because of DTA utilization; in 2016Q1, for example, DTA-utilization (labeled as “other CET1” in Chart 3) contributed ~$1.6bn of capital compared to $3.2bn for retained earnings and $2.7bn of OCI. The specifics are that, under regulatory capital rules, some of the contribution of DTA’s to tangible equity must be excluded from the calculation of the CET1 ratio. 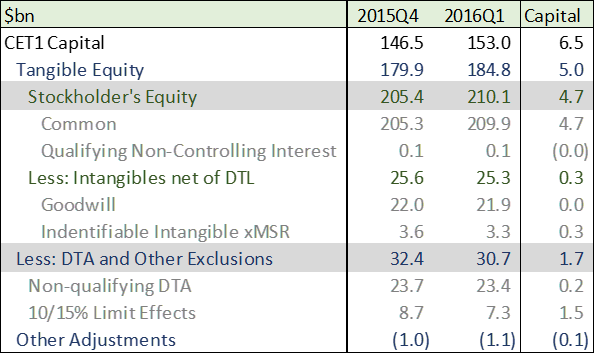 Indeed, of $46.3bn of net DTAs at end-2016Q1, only $17.3bn are includable in regulatory capital with the balance being a regulatory capital deduction from tangible stockholder’s equity (see Chart 4). Source: Company Reports. Common stockholders’ equity for regulatory purposes differs slightly from GAAP because it excludes issuance costs for preferred stock; these amounted to $178mm and $147mm in 2016Q1 and 2015Q4 respectively.